2nd in the NW division. 4th overall in the Western Conference. 4th overall IN THE ENTIRE LEAGUE. I mean, blog over, right? Five game winning streak, three goals-allowed. That's not all! If you call now we'll DOUBLE the offer! 8-1-2 against the West (best record in the league vs. the West). 4-0-1 against the NW division. I've felt they were on the right track all summer. But I didn't necessarily think that would manifest itself in a playoff season this year. But now....well it's exciting, what they're doing. No they're not world-beaters, yet. But look, you allow three goals in five games and something's going right. Several things, in fact. Obviously the goaltending is tremendous right now. I can't remember another time when BOTH Wild goalies were as hot as Backstrom and Harding are right now. Backstrom wasn't even at his best last night (four games off will do that to you I suppose) and he still looked great several times and obviously more-than adequate all the other times he had to make a save. But 0.60 goals per game over 5 games is a meaningful sample to indicate that the entire team is playing well in front of the goalies. Flames fans were lamenting that the 41 saves Backstrom made last night were greater than the number of high percentage shots he had to turn aside - and they are right. The Wild is getting solid buy-in from its defense corps and the forwards are clearly helping out as well. 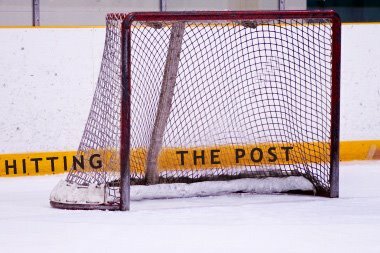 As a goalie I'll take shots from the wall by the hash marks all night long. No, this is more than the goalies playing great. This is the whole team doing what it takes on defense. If that wasn't happening, the Wild would have allowed a lot more than 3 goals in the last 5 games, and that's not mutually exclusive from the goalies playing great. Last night wasn't the prettiest game, but honestly I think the 17 minutes of penalties the Wild had to kill played a big part in that. The start was ugly, but the way they rallied around the PK was inspiring. All this amounts to one thing: I'm starting to believe in this team. This year's team. I'm watching them win games and then reading about Yeo saying how much better they can be and I'm letting my imagination run a little bit. Maybe they can be a playoff team this season. They've only not garnered at least one point in a game three times so far, and they've followed them each up with at least one point in the next game each time. Again, that's encouraging. Yes, it's early. A lot can and will happen between now and when playoff invitations are sent out.